Viva la causa! 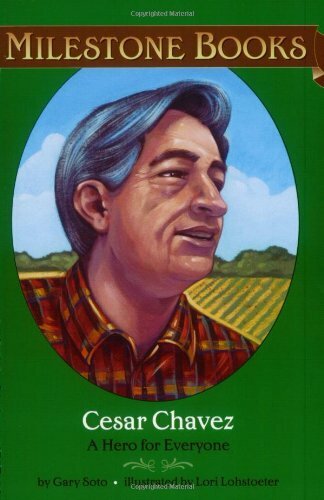 Viva Cesar Chavez!Up and down the San Joaquin Valley of California, and across the country, people chanted these words. Cesar Chavez, a migrant worker himself, was helping Mexican Americans work together for better wages, for better working conditions, for better lives.No one thought they could win against the rich and powerful growers. But Cesar was out to prove them wrong -- and that he did. Recogniton of Merit from the Claremont Graduate School for Baseball in April, the Silver Medal from The Commonwealth Club of California, and the Toms Rivera Prize, in addition to fellowships from the Guggenheim Foundation, the National Endowment for the Arts twice, and the California Arts Council. For ITVS, he produced the film The Pool Party, which received the 1993 Andrew Carnegie Medal. Soto wrote the libretto for an opera titled Nerd-landia for the The Los Angeles Opera. In 1999 he received the Literature Award from the Hispanic Heritage Foundation, the Author-Illustrator Civil Rights Award from the National Education Association, and the PEN Center West Book Award for Petty Crimes. He serves as Young People's Ambassador for the California Rural Legal Assistance and the United Farm Workers of America. Soto is the author of ten poetry collections for adults, with New and Selected Poems a 1995 finalist for both the Los Angeles Times Book Award and the National Book Award. His recollections Living Up the Street received a Before Columbus Foundation 1985 American Book Award.